Multidisciplinary artist and renowned eco-design sculptor, Nirit Levav Packer has unveiled her new gallery in the vibrant and historic Jaffa flea market, Israel. Here she is showcasing more than 300 works created completely from recycled materials. If you don't believe that something new and surprising can come out of bicycle parts and metal scraps, you should drop into the new art gallery of renowned Israeli sculptor Nirit Levav Packer. For years now, she has been creating her artworks, including large-scale sculptures, exclusively from unusual recycled raw materials and metals, like bicycle chains, keys and light bulbs, mattress frames and coils, sea sand, and gravel as well as other undesired scraps. 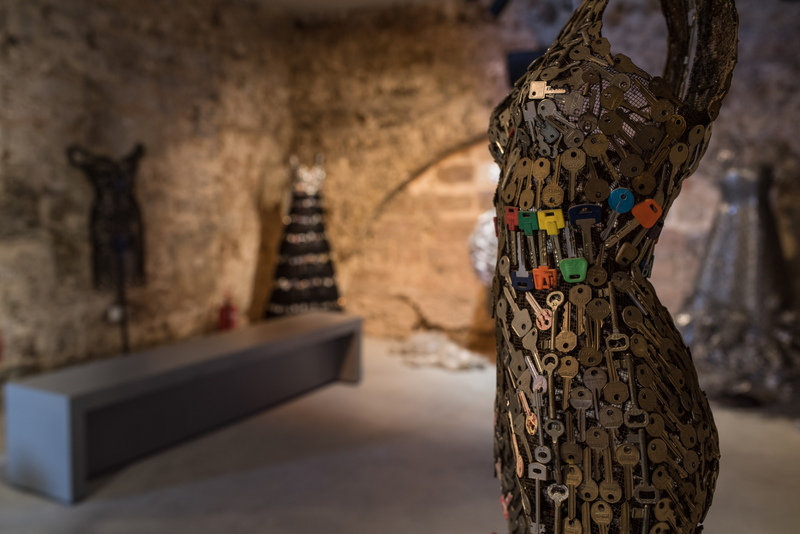 A few weeks ago, in August, the artist opened her own art gallery in Jaffa, the ancient port from which modern-day Tel Aviv grew. A hidden gem in the bustling Jaffa flea market, or Shuk Hapishpishim, a tourist hotspot and local attraction where the footpaths are lined with people selling all kinds of products. The Nirit Levav Packer Gallery is located in an original Ottoman building, which once housed the horse stables of the historic Kahn Hotel and that has now been converted into a sleek contemporary art and design space on Oleh Zion Street. The gallery itself comprises 400-square-metres of exhibition spaces inside the historical structure, which has been restored to its original splendour, with mezzanines and black steel furnishings creating pleasant contrasts. The gallery is a new and dynamic attraction in Jaffa that caters to a broad range of visitors, welcoming adults, children and even pets! The Nirit Levav Packer Gallery, whose simple interiors are reminiscent of their former use, features artworks from two important collections by Levav Packer, along with jewellery and various works of art created by the artist from Herzliya, a city north of Tel Aviv, over the past few years. You can see her large-scale sculptures from the "From Within” series. Here, the artist represents the complexities of motherhood in the 21st-century through sculptures of pregnant women, which she created by welding together chains, gears, twigs and springs, valves and other scrap materials, in order to symbolise the new, complex woman, the strong woman; despite - or perhaps because of - these unusual materials, the artist's sensitivity and humanity shine through. The "Unchained" series, instead, is the experimental output of Nirit Levav Packer, who started her career in fashion design after graduating from Parsons School of Design in New York City and showcases her work on a single subject, made from a single material. The result is a series of full-scale dogs, made mostly from bicycle chains that the artist collects from garages and bicycle stores across Tel Aviv, combining contemporary art and various complex techniques that evolve throughout the process. Her dogs, together with the sculptures of women, are the heart and soul of the gallery, a must-see experience for art lovers as well as for admirers of architecture and interior design. What we have here is an environment whose charm stems from the skilful fusion of past and present and the interaction with the urban context that Nirit Levav Packer expresses through the materials she uses to create her works of art.